Kimberly P. of Pennsylvania is the winner of the Picture My IBS competition, an initiative aimed at encouraging individuals to express their experience with irritable bowel syndrome (IBS) and to share their journey – and the symptoms that affect them – through art and narrative, according to an April 26 announcement from The American College of Gastroenterology (ACG), in collaboration with Allergan and Ironwood Pharmaceuticals, Inc.
Communication between patients and their doctors was cited as what was lacking most in IBS treatment, according to a recent physician survey, As a result, the Picture My IBS competition was developed to engage, connect, inspire and motivate the IBS community to share their personal experiences with the goal of improving patient-physician communication and, ultimately, patient care. Entrants were asked to submit their own original artwork and corresponding story to showcase the unseen struggles many IBS patients face. “There were many powerful images submitted by the entrants, and aside from artistic merit, the ACG also recognized the winning artwork for its creativity and motivation impact in expressing a personal journey with IBS,” said Dr. Brian E. Lacy, Co-Editor-in-Chief of The American Journal of Gastroenterology and one of the judges for the Picture My IBS competition. Dr. Eamonn M.M. Quigley also served as a physician judge. Through this contest, the College sought to highlight how personal stories and insights shared through artistic expression may help bridge the communication gap between patient and physician, which is particularly important in a condition like IBS, where symptoms such as abdominal pain and constipation or diarrhea can be embarrassing for patients to discuss, even with a physician. The campaign kicked off in October 2016, at ACG’s Annual Scientific Meeting in Las Vegas, NV. 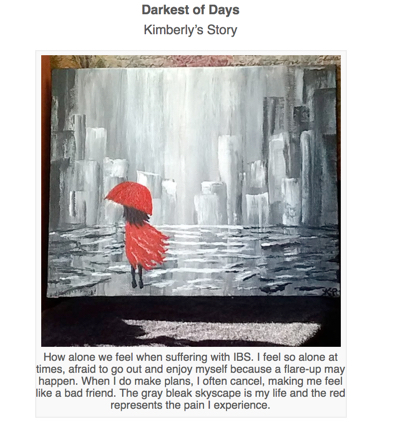 The winning entry will be featured via PictureMyIBS.org during April – in honor of IBS Awareness Month – helping to bring to life the journey, struggle and hope experienced by many patients with IBS. The ACG said runners-up are being notified and will be announced next week. See additional submissions on the ACG Blog For additional information about the Picture My IBS campaign and living with IBS, please visit, PictureMyIBS.org.